The short prayer, commonly known as St. Anthony’s Brief (or Motto) (St. Anthony: Lisbon, August 15th, 1195 – Padua, June 13th 1231) according to the testimony of Giovanni Rigaude (XIII cen.) has been originated from a prodigy, as follows. In Portugal a poor woman, severely stalked by the devil, lived in the town of Santaren. Because of this disturbance, the poor woman used to have an odd behavior that made her inexplicably bizarre even to herself. One day her husband, in a moment of anger, yelled that she was possessed. The poor woman who’d been demonically oppressed, resolved to do the unthinkable by taking her own life by drowning herself in the Tagus River. On her way to the river, she passed a Franciscan church where they were celebrating the solemn feast of St. Anthony of Padua: it was June 13th, feast day of the Saint. The poor woman stopped to pray, one last time. As she prayed, heartbroken for the battle that she was fighting in her heart and exhausted for her fatigue, she fell asleep and dreamt of St. Anthony standing before her, saying, “Arise woman, and take this paper, which will free you from the molestations of the Evil One”. Then he gave her a parchment inscribed with what is now known as the “Brief or Motto of St. Anthony”, with the sign of the Cross: “Ecce Crucem Domini, Fugite, partes adversae, Vicit Leo de Tribu Juda, Radix David, alleluia!” (Behold the Cross of the Lord! Begone, all evil powers! The Lion of the Tribe of Juda, The Root of David has conquered, Alleluia!). The woman, holding the prodigious parchment on her heart, was now free from demonic oppression and went back home full of hope. Her husband, becoming aware of the secret, talked about it everywhere. News of this miracle spread, even to the King who asked the woman for the Brief. He placed it with the Crown Jewels of Portugal, and refused to give it back to the woman. She sought help and the Franciscan friars obtained from the King an exact copy of the parchment. What a joy when they found out that the copy had the same virtue of the original parchment. With the support of the Franciscan Order, this prayer – commonly known as Saint Anthony’s Motto (or Brief) – was rapidly widespread also thanks to the Franciscan Pope Pious V (1585-1590) who had it engraved at the bottom of the obelisk that he wanted to set up in Rome in St. Peter’s Square, where it still is today. But not only. We can find the prayer of St. Anthony’s Brief (or Motto) – that has an undoubted exorcistic value – also in the two Rituals of exorcism, today in use to the Catholic Church: both in the 1614 old Ritual and in the 2004 new Ritual issued by John Paul II. Furthermore, the first part of this powerful short prayer is already present in the Holy Scriptures and precisely in the Book of Apocalypse where, in Chapter 5 Verse 5 we read: “Vicit Leo de tribu Iudae, radix David” (The Lion of the tribe of Judah, the root of David, has triumphed). 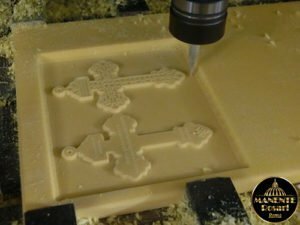 Being aware of the spiritual value and power of this very special short prayer, MANENTE Rosaries (Rome) wanted to create a special proprietary cross that we name Saint Anthony’s Cross. It has a short exorcism on the back – the so-called Saint Anthony’s Brief or Motto. This beautiful Crucifix embellish some of our most beautiful and meaningful Rosaries, but you can also buy the single crucifix. Saint Anthony, pray for us! Glory be to God!